"Abgar" redirects here. For other uses, see Abgar (disambiguation). Abgar V (died c. AD 40), called Ukkāmā "the Black",[a] was the King of Osroene with his capital at Edessa. 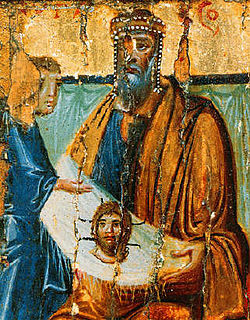 Icon of Abgar holding the mandylion, the image of Christ (encaustic, 10th century, Saint Catherine's Monastery, Mount Sinai). King Abgar illustration in Gaidzakian, Ohan (1898). Illustrated Armenia and Armenians. Boston. Abgar was described as "king of the Arabs" by Tacitus, a near-contemporary source. According to Movses Khorenatsi, Abgar was an Armenian. Yet both Robert W.Thomson and Richard G. Hovannisian state Abgar's Armenian ethnicity was invented by Khorenatsi. Most modern academics present the Abgarid dynasty as an Arab dynasty. Consequently, Lucas Van Rompay, Professor Emeritus of Religious Studies, states that, "as far as the ethnic descent of the Abgarid kings is concerned, we cannot ascertain whether they were Arabs(as some of the names may indicate), Aramean, Parthian, or Armenian". Abgar's nephew, King Sanatruk of Armenia, is also chronicled extensively in Armenian writings. Abgar V came to power in 4 BC. He became a Roman client, lost his throne in 7 AD and regained it five years later. As to the first of Abgar’s wives, named Helena... She went away to Jerusalem in the time of Claudius, during the famine which Agabus had predicted; with all her treasures she bought in Egypt an immense quantity of corn, which she distributed amongst the poor, a fact to which Josephus testifies. Helena’s tomb, a truly remarkable one, is still to be seen before the gate of Jerusalem. Professor Eisenman goes on to equate King Abgarus V with the Agabus in Acts of the Apostles (Acts 11:27-30), because Agabus was identified with the same famine relief as Queen Helena. By necessity Eisenman then equates the biblical Antioch Orontes with Antioch Edessa, indicating that Paul the Apostle and Barnabas went to Edessa. On August 24, 2009, the board of the Central Bank of Armenia adopted a decision on introducing a new banknote with a nominal value of AMD 100,000. The new banknote depicts King Abgar V, described as King of Armenian Mesopotamia. The front of the banknote depicts Abgar pointing at the royal flag bearing an image of the Mandylion. The reverse of the banknote depicts disciple Thaddeus of Edessa handing the canvas to King Abgar V and his consequent miraculous healing. Abgar V is claimed to be one of the first Christian kings in history, having been converted to the faith by Thaddeus of Edessa, one of the seventy disciples. The church historian Eusebius records that the Edessan archives contained a copy of a correspondence exchanged between Abgar of Edessa and Jesus. The correspondence consisted of Abgar's letter and the answer dictated by Jesus. On August 15, 944, the Church of St. Mary of Blachernae in Constantinople received the letter and the Mandylion. Both relics were then moved to the Church of the Virgin of the Pharos. The account of this enjoyed great popularity in the East, and also in the West, during the Middle Ages: Jesus' letter was copied on parchment, inscribed in marble and metal, and used as a talisman or an amulet. Of this correspondence, there survive not only a Syriac text, but an Armenian translation as well, two independent Greek versions, shorter than the Syriac, and several inscriptions on stone. A curious growth has arisen from this event, with scholars disputing whether Abgar suffered from gout or from leprosy, whether the correspondence was on parchment or papyrus, and so forth. Abgar, ruler of Edessa, to Jesus the good physician who has appeared in the country of Jerusalem, greeting. I have heard the reports of you and of your cures as performed by you without medicines or herbs. For it is said that you make the blind to see and the lame to walk, that you cleanse lepers and cast out impure spirits and demons, and that you heal those afflicted with lingering disease, and raise the dead. And having heard all these things concerning you, I have concluded that one of two things must be true: either you are God, and having come down from heaven you do these things, or else you, who does these things, are the son of God. I have therefore written to you to ask you if you would take the trouble to come to me and heal all the ill which I suffer. For I have heard that the Jews are murmuring against you and are plotting to injure you. But I have a very small yet noble city which is great enough for us both. Blessed are you who hast believed in me without having seen me. For it is written concerning me, that they who have seen me will not believe in me, and that they who have not seen me will believe and be saved. But in regard to what you have written me, that I should come to you, it is necessary for me to fulfill all things here for which I have been sent, and after I have fulfilled them thus to be taken up again to him that sent me. But after I have been taken up I will send to you one of my disciples, that he may heal your disease and give life to you and yours. Egeria wrote of the letter in her account of her pilgrimage in Edessa. She read the letter during her stay, and remarked that the copy in Edessa was fuller than the copies in her home (which was likely France). In addition to the importance it attained in the apocryphal cycle, the correspondence of King Abgar also gained a place in liturgy for some time. The Syriac liturgies commemorate the correspondence of Abgar during Lent. The Celtic liturgy appears to have attached importance to it; the Liber Hymnorum, a manuscript preserved at Trinity College, Dublin (E. 4, 2), gives two collects on the lines of the letter to Abgar. It is even possible that this letter, followed by various prayers, may have formed a minor liturgical office in some Catholic churches. This event has played an important part in the self-definition of several Eastern churches. Abgar is counted as saint, with feasts on May 11 and October 28 in the Eastern Orthodox Church, August 1 in the Syrian Church, and daily in the Mass of the Armenian Apostolic Church. The Armenian Apostolic Church in Scottsdale, Arizona, is named after Saint Abgar (also spelled as Apkar). The scholar Bart D. Ehrman cites evidence from Han Drijvers and others for regarding the whole correspondence as forged in the third century by orthodox Christians "as an anti-Manichaean polemic", and entirely spurious. Significant advances in scholarship on the topic have been made by Desreumaux's translation with commentary, M. Illert's collection of textual witnesses to the legend, and detailed studies of the ideology of the sources by Brock, Griffith, and Mirkovic. The majority of scholars now claim the goal of the authors and editors of texts regarding the conversion of Abgar were not so much concerned with historical reconstruction of the Christianisation of Edessa as the relationships between church and state power, based on the political and ecclesiological ideas of Ephraem the Syrian. However, the origins of the story are far still from certain, although the stories as recorded seem to have been shaped by the controversies of the third century CE, especially as a response to Bardaisan. ^ Arabic: أبجر الخامس أوكاما‎, translit. ʾAḇgar al-Ḥāmis ʾUkkāmā, Syriac: ܐܒܓܪ ܚܡܝܫܝܐ ܐܘܟܡܐ‎, translit. ʾAḇgar Ḥmišāyā ʾUkkāmā, Armenian: Աբգար Ե Եդեսացի, translit. Abgar Hingerord Yedesatsi, Greek: Ἄβγαρος, translit. Abgaros, Latin: Abgarus. Vailhé, Siméon (1913). "Edessa" . In Herbermann, Charles (ed.). Catholic Encyclopedia. New York: Robert Appleton Company. ^ Nersessian, Vrej (2001). Treasures from the Ark: 1700 Years of Armenian Christian Art. Oxford University Press. p. 224. ISBN 978-0892366392. ^ "ABGAR Encyclopaedia Iranica". www.iranicaonline.org. ^ Syriac Historiography and Identity Formation, Muriel Debié, Church History and Religious Culture,Vol. 89, No. 1/3, Religious Origins of Nations? The Christian Communities of the Middle East (2009), p.100. ^ Eisenman 1992, p. 8. Movses Khorenatsi. "History of Armenia" . In Roberts, Alexander; Donaldson, James; Coxe, Arthur Cleveland; Schaff, Philip (eds.). Memoirs of Edessa And Other Ancient Syriac Documents. Ante-Nicene Fathers. Vol. VIII. Translated by Pratten, Benjamin Plummer. Chapter 10. .
^ Eisenman 1992, p. 1. ^ "CBA issues 100.000 Dram banknotes". PanARMENIAN Network. 24 August 2009. Retrieved 21 March 2017. ^ Fortescue, Adrian (December 2001). "Lesser Eastern Churches". ISBN 978-0-9715986-2-1. ^ In his Church History, I, xiii, ca AD 325. ^ Janin, Raymond (1953). La Géographie ecclésiastique de l'Empire byzantin. 1. Part: Le Siège de Constantinople et le Patriarcat Oecuménique. 3rd Vol. : Les Églises et les Monastères (in French). Paris: Institut Français d'Etudes Byzantines. p. 172. Leclercq, Henri (1913). "The Legend of Abgar" . In Herbermann, Charles (ed.). Catholic Encyclopedia. New York: Robert Appleton Company. ^ Bernard, John. "The Pilgrimage of Egeria". University of Pennsylvania. Palestine Pilgrims' Text Society. ^ Adler, William (2011). "Christians and the Public Archive". In Mason, E.F. (ed.). A Teacher for All Generations: Essays in Honor of James C. VanderKam. Supplements to the Journal for the Study of Judaism. Brill. p. 937. ISBN 978-90-04-22408-7. Retrieved 25 January 2017. ^ Bauer 1971, Chapter 1. ^ Camplani 2009, p. 253. ^ Histoire du roi Abgar et de Jésus, Présentation et traduction du texte syriaque intégral de la Doctrine d’Addaï par. A. Desreumaux, Brepols, Paris 1993. ^ S.P. Brock, Eusebius and Syriac Christianity, in H.W. Attridge-G. Hata (eds. ), Eusebius, Christianity, and Judaism, Brill, Leiden-New York-Köln 1992, pp. 212-234, republished in S. Brock, From Ephrem to Romanos. Interactions between Syriac and Greek in Late Antiquity (Variorum Collected Studies Series, CS644), Ashgate/Variorum, Aldershot-Brookfield-Singapore- Sydney 1999, n. II. ^ a b Mirkovic 2004. ^ a b Camplani 2009. ^ Griffith 2003, §3 and §28. ^ Mirkovic 2004, pp. 2-4. Camplani, Alberto (2009). "Traditions of Christian foundation in Edessa: Between myth and history" (PDF). Studi e materiali di storia delle religioni (SMSR). 75 (1): 251–278. Retrieved 25 January 2017. Chapman, Henry Palmer (1913). "Doctrine of Addai" . In Herbermann, Charles (ed.). Catholic Encyclopedia. New York: Robert Appleton Company. Eisenman, Robert (1997). "Judas the brother of James and the conversion of King Agbar". James the Brother of Jesus. Holweck, F. G. (1924). A biographical dictionary of the saints. St. Louis, MO: B. Herder Book Co.
Mirkovic, Alexander (2004). Prelude to Constantine: The Abgar tradition in early Christianity. Arbeiten zur Religion und Geschichte des Urchristentums. Frankfurt am Main: Peter Lang. von Tischendorf, Constantin. "Acta Thaddei (Acts of Thaddeus)". Acta apostolorum apocr. p. 261ff. Wilson, Ian (1991). Holy faces, secret places. English translation of ancient documents on the conversion of Abgar, including relevant passages from Eusebius and the Doctrine of Addai are available in Cureton, W. (1864). Ancient Syriac documents. London, UK: Williams and Norgate. p. 1–23. Retrieved 15 June 2017.